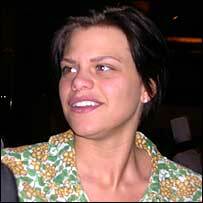 Big Brother contestant Jade Goody has arrived in India on what she describes as a private visit. Ms Goody faced accusations of racism towards Bollywood actress Shilpa Shetty when they took part in Channel Four show Celebrity Big Brother in January. Ms Goody denied being racist but apologised for referring to Ms Shetty as "Shilpa Poppadom" and other remarks. The controversy made front-page news in India but reaction among ordinary Indians to the row was generally muted. Hours after her arrival in India, Ms Goody was spotted having lunch at a restaurant in the five-star Le Meridien hotel in the capital, Delhi. She was accompanied by three people, including two British Asians one of whom told the BBC that they had "only just arrived and were very tired". A BBC correspondent in Delhi says that Goody sat quietly tucking into a plate of masala dosa under the watchful gaze of a security guard. When the group emerged from the restaurant they ran into a media scrum and had to literally fight their way through the crowd of journalists. "I'm here on a private visit, that's really all I can say at the moment," Goody told the BBC. "But I've been made to feel very welcome so yes, it's been very good so far." It is not clear how long she intends to stay or what she will do during her visit. The way that Goody and some of the other Big Brother contestants treated Ms Shetty resulted in more than 40,000 people complaining to the UK media regulator, Ofcom. Shilpa Shetty was almost unheard of in the UK outside the British Asian community before she entered the Big Brother competition. She soon became a household name. After she won the contest she was invited to visit the Houses of Parliament and to take tea with Prime Minister Tony Blair.